Dorm living should be fun. Your dorm room should be a place to relax after a long school day. To be fun, however, your dorm room will have to look fun. To do so, you'll need color, and plenty of it. On their own, dorm rooms are bland, boring, and even downright depressing! So first things first. Throw down a beautiful, colorful dorm rug to transform that room into the pretty, homey, and welcoming destination it should be upon returning from tough exams and long study sessions. While you may have already dressed up those walls with all sorts of dorm wall decorations, your eyes will take in plenty of floor space, too—that's a lot of blank space if there's no college dorm rug to cover it! This Pink Peace Rug, as you probably saw, has little peace signs strewn across it to give it that extra decorative element and to even let your inner hippie out a bit. And when friends come to visit, they'll frequently probably end up stuck on the floor since dorm rooms seriously lack seating space. With a cheap rug, they'll at least have something to sit on—don't be surprised if you get a few compliments on that pretty pink rug. 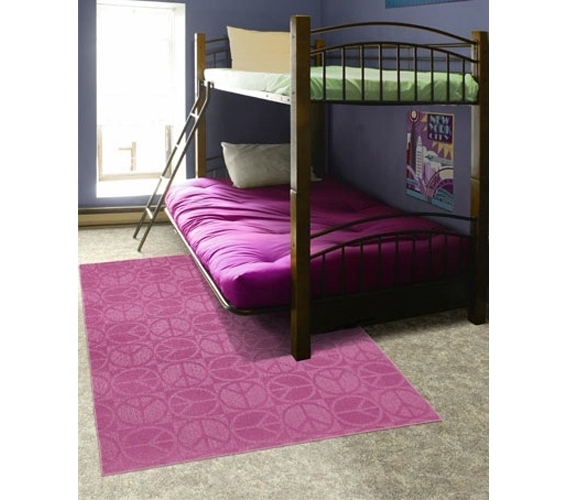 Dorm rugs, especially cool-looking ones like this Pink Peace Rug, are those extra dorm decor elements that will set your room apart from your neighbor's. It's that combination of making your room look better while making the floor feel better that makes rugs for dorm rooms essential college items. 4' x 6' = A rug for college, this size will make a great centerpiece for your room to really enhance your dorm room decor. It'll soften up those cold, hard floors and make a little hangout zone for when friends visit.